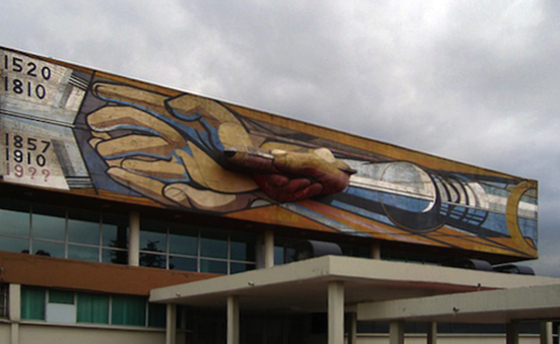 At the National Autonomous University of Mexico (UNAM) in Mexico City visitors enter the rectory (the main administration building), beneath an imposing three-dimensional arm emerging from a mural. Several hands, one with a pencil, charge towards a book, which lists critical dates in Mexico’s history: 1520 (the Conquest by Spain); 1810 (Independence from Spain); 1857 (the Liberal Constitution which established individual rights); and 1910 (the start of the Revolution against the regime of Porfirio Díaz). David Alfaro Siqueiros left the final date blank in Dates in Mexican History or the Right for Culture (1952-56), inspiring viewers to create Mexico’s next great historic moment. From 1910 to 1920 civil war ravaged the nation as citizens revolted against dictator Porfirio Díaz. At the heart of the Revolution was the belief—itself revolutionary—that the land should be in the hands of laborers, the very people who worked it. This demand for agrarian reform signaled a new age in Mexican society: issues concerning the popular masses—universal public education and health care, expanded civil liberties—were at the forefront of government policy. At the end of the Revolution the government commissioned artists to create art that could educate the mostly illiterate masses about Mexican history. 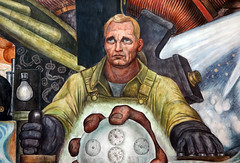 Celebrating the Mexican people’s potential to craft the nation’s history was a key theme in Mexican muralism, a movement led by Siqueiros, Diego Rivera, and José Clemente Orozco—known as Los tres grandes. Between the 1920s and 1950s, they cultivated a style that defined Mexican identity following the Revolution. 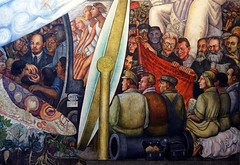 The muralists developed an iconography featuring atypical, non-European heroes from the nation’s illustrious past, present, and future—Aztec warriors battling the Spanish, humble peasants fighting in the Revolution, common laborers of Mexico City, and the mixed-race people who will forge the next great epoch, like in Siqueiros’ UNAM mural. 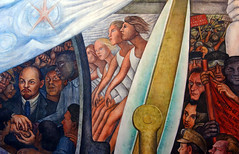 Los tres grandes crafted epic murals on the walls of highly visible, public buildings using techniques like fresco, encaustic, mosaic, and sculpture-painting. 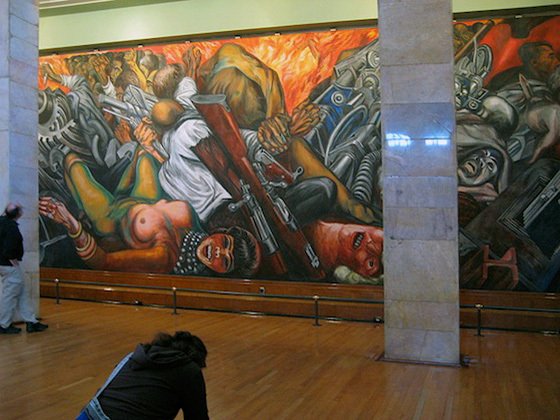 One of the earliest government commissions for a post-Revolution mural was for the National Preparatory School, a high school in Mexico City affiliated with UNAM. During the 1920s Los tres grandes and other artists completed works throughout the school’s expansive exteriors and interiors. 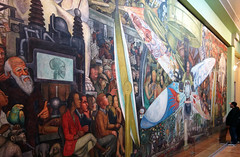 Orozco painted nearly two dozen murals at the school including Destruction of the Old Order, 1926. It depicts two figures in peasant attire who watch nineteenth-century neoclassical structures fracture into a Cubist-like pile, signaling the demise of the past. Just as Siqueiros’ UNAM murals anticipate an unrealized historic event, the “new order” implied in Orozco’s work is the world these men will encounter once they turn to face the viewer. These anonymous men are unlikely heroes given their modest attire, yet they represent a new age where the Revolution has liberated the masses from centuries of repression. In 1934 the government inaugurated the Palace of Fine Arts Mexico City, which soon became the nation’s most important cultural institution. 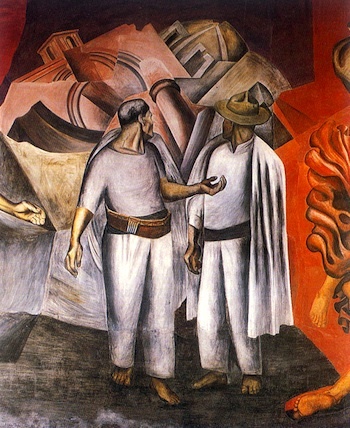 The Palace’s Museum, Mexico’s first art museum, opened the same year with works by two of Los tres grandes: Rivera’s Man, Controller of the Universe, 1934, a recreation of Man at the Crossroads (painted at Rockefeller Center and destroyed the year before), and Orozco’s Catharsis, 1934. The title of Orozco’s painting dates to 1942, when an art historian speculated that the fire at the top of the composition symbolized catharsis, and thus “the only possibility of saving and purifying civilization” as it succumbed to the excesses of moral depravity. The laughing central figure jerks the viewer into an immoral world, where the malevolent aspects of modern life—senseless warfare, destructive technology, and prostitution—run rampant. 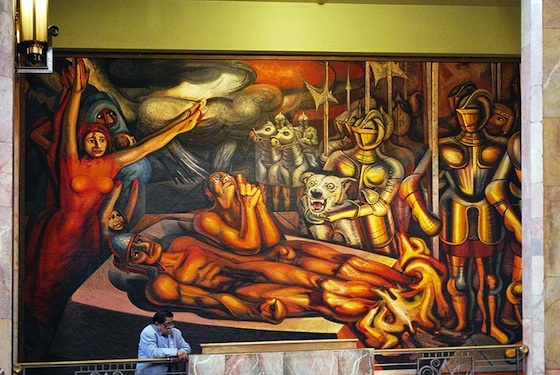 In Torment and Apotheosis of Cuauhtémoc, 1950-51, another mural at the Museum of the Palace of Fine Arts, Siqueiros explores the violent period of the Conquest. In this mural Spanish soldiers torture the Mexican tribal leader for information on the location of the treasure they seek. The Mexican motherland, symbolized by the blood-stained female figure, stretches her arms protectively over his still figure. 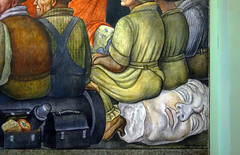 Siqueiros’ penchant for sinewy limbs, showcased in the UNAM murals and exemplified here in the bodies of Cuauhtémoc and his praying companion, underscore the tension in this encounter. The Mexican Revolution was a watershed moment in the twentieth century because it marked a true break from the past, ushering in a more egalitarian age. With its grand scale, innovative iconography, and socially relevant message, Mexican muralism remains a notable compliment to the Revolution. 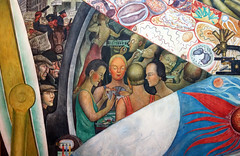 The way the muralists reoriented history, recovered lost stories, and drafted new narratives continues to stir audiences and inspire artists, like the Chicano muralists that emerged in the U.S. Southwest. The fact that their in-situ masterpieces can still be seen publicly in Mexico and beyond is a testament to their relevance, popularity, and the power of their didactic message. 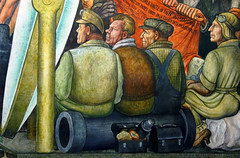 Cite this page as: Dr. Doris Maria-Reina Bravo, "Mexican Muralism: Los Tres Grandes—David Alfaro Siqueiros, Diego Rivera, and José Clemente Orozco," in Smarthistory, August 9, 2015, accessed April 20, 2019, https://smarthistory.org/mexican-muralism-los-tres-grandes-david-alfaro-siqueiros-diego-rivera-and-jose-clemente-orozco/.